Posted 6 December 2010 in Bonus, Cooke Looks, The New Gods #1. With Jack Kirby’s fine work on Superman’s Pal, Jimmy Olsen and The Forever People, we’ve already got a good look at the conflict developing on Earth, but here, in “Orion Fights For Earth!” we now get view of the cosmic dimension, and it’s an awesomely impressive image of an unfolding complex tapestry of celestial intrigue with a universe-quaking background story. 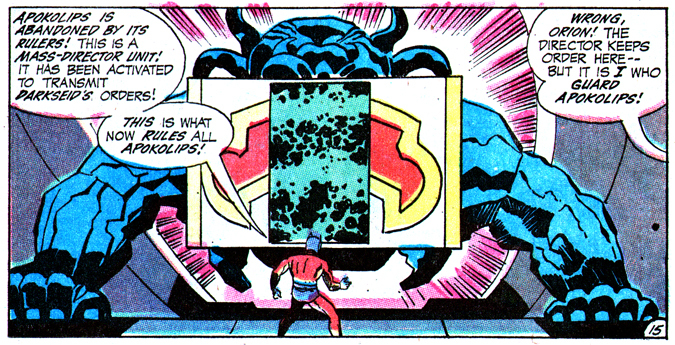 As is appropriate for a Kirby epic, this is BIG stuff, involving BIG characters and BIG concepts. The comic book opens in cataclysmic fashion, Ragnarok depicted on page one; the violent, fiery creation of two planets on page two; and a gorgeous close-up of our hero with that extraordinary helmet on page three. I mean, counting the magnificent depiction of Supertown on page five, that’s three full-pagers out of the first five… and they are so gorgeous, it makes one yearn for an entire book of Jack Kirby splashes! There’s really not much more I can add. It’s a magnificent debut for the title, arguably the best of the Fourth World quartet of comics, and it confidently — and with supreme competence — sets the stage for the Super War on Earth to come… A bravura performance by THE master of adventure comics. 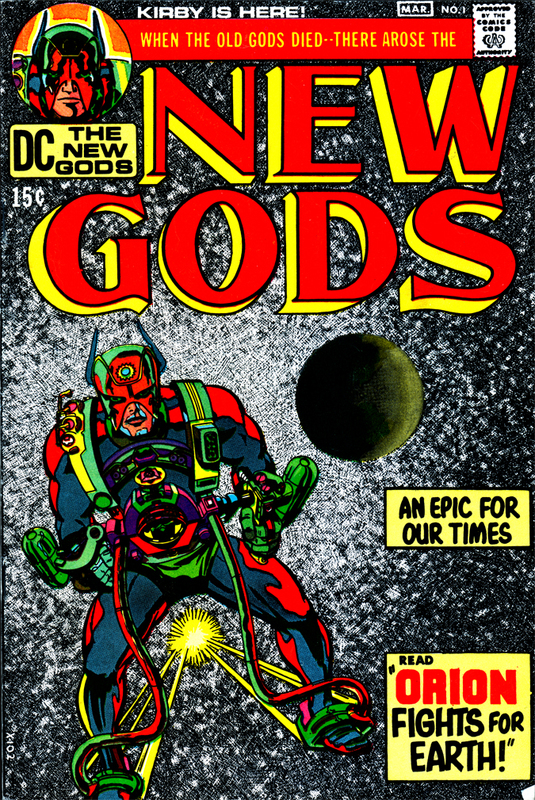 Posted 3 December 2010 in Apokolips, Day Entries, The New Gods #1, Weapons & Devices. 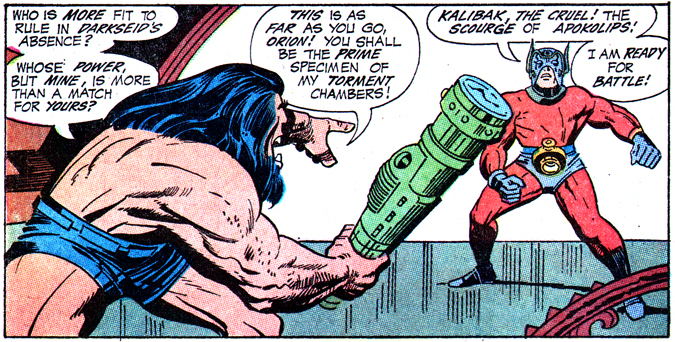 And when the eldest son of Darkseid and half-brother of Orion comes on the scene, you can bet your Mother Box that Kalibak will be wielding his dreaded Beta-Club, with its agonizing Nerve Beam capability! Though Orion absorbs a portion of the impact, still “My body is afire as if with a mortal wound,” thinks our hero. Needless to say, Kalibak’s half-brother survives. 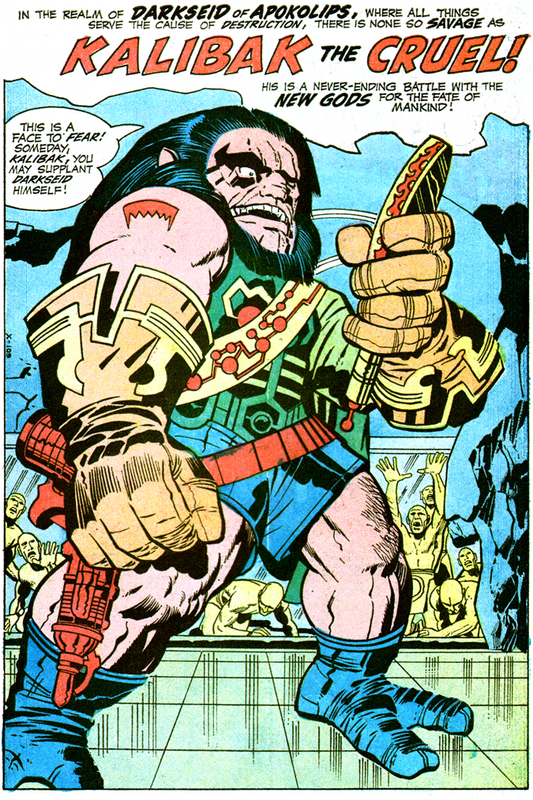 As Orion and his new Earth allies depart Apokolips via Boom Tube, Kalibak hurls his Beta-Club at the retreating guests, but the weapon falls just short of connecting and the Tube dissipates. 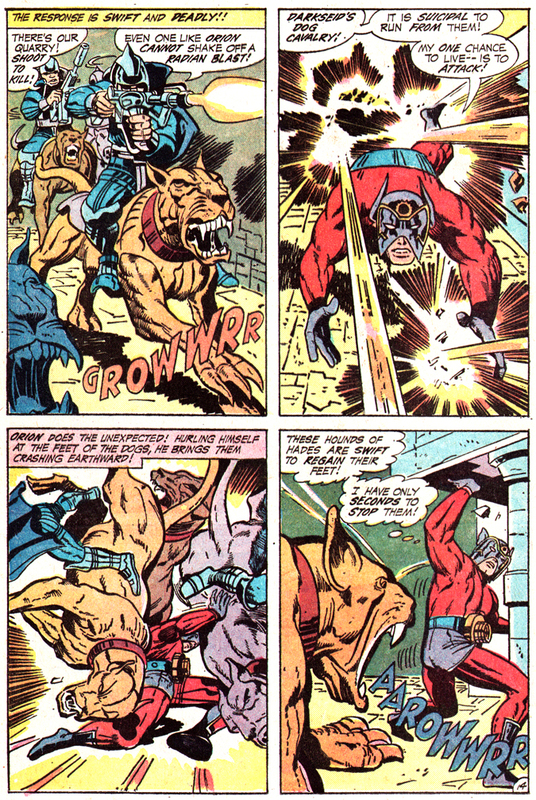 Kalibak uses his weapon to smash into Dave Lincoln’s apartment and splinter the cop’s furniture. Then the Beta-Club blasts Metropolis police officers, including Detective Sergeant Daniel Turpin, who brazenly takes on Kalibak, only to get beaten to a pulp. Orion flies in with Lightray to save “Terrible” Turpin, who is being flung about like a rag doll by Kalibak. 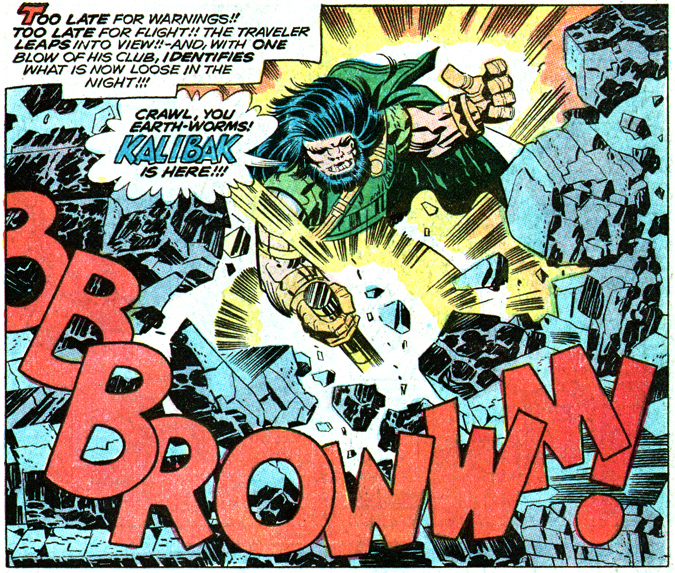 Then, in a great Kirby panel of elemental ferocity, Kalibak smashes his club upside Orion’s head and, in the next, square down atop his helmet. Brutal! Kalibak turns on Lightray and is about to bludgeon the young new god when Orion grasps his half-brother’s truncheon and, with “overwheming” fierceness, the foster son of Highfather twists the Beta-Club from the beast-man’s grasp. 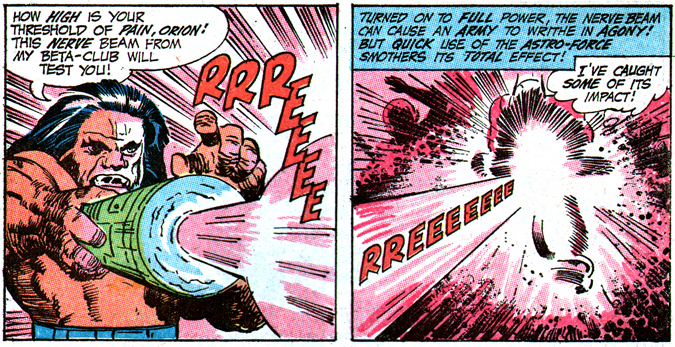 Then, a piece of the disabled weapon in each hand, Orion jams them into the sides of Kalibak’s head, and, well, let’s just say a world-class Super-War donnybrook ensues! 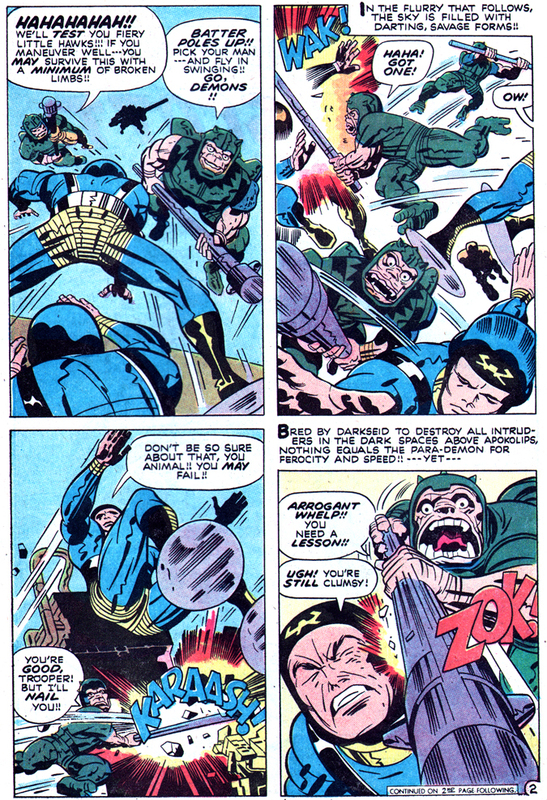 That unprecedented “Death of a Weapon” sequence is, of course, the last we see of Kalibak’s Beta-Club! Day 63: Kalibak the Cruel! 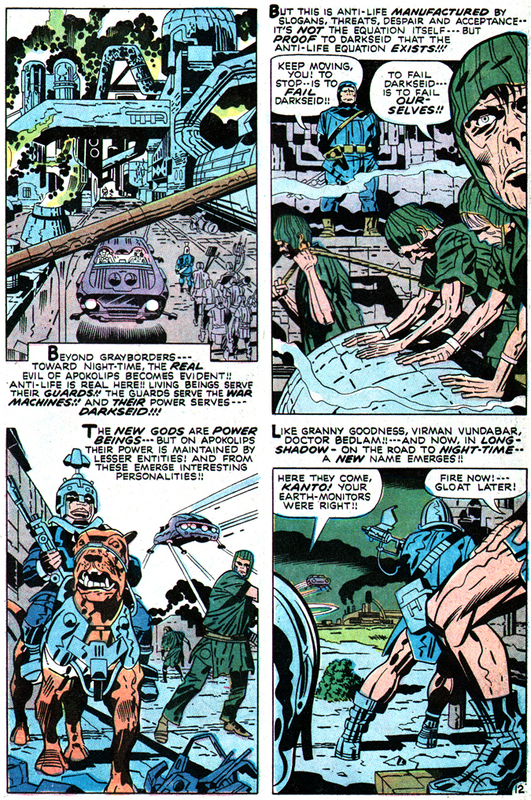 Posted 2 December 2010 in Apokolips, Day Entries, The New Gods #1, Villains. Once upon a time, there were two rival kingdoms that fought one another, one side good and the other bad. In the evil land ruled a monster and throughout his court there were many intrigues, as his underlings coveted the throne and vied for the tyrant’s favor. In a previous era both domains suffered a terrible conflict between them and the monster sought a truce to bide time and rebuild his vast army. So he offered a bargain to the other king and they exchanged sons, each to be raised in the other’s respective kingdom. Unbeknownst to the monster’s royal court was that the leader once led a secret life and had had a clandestine marriage to a lover, a passionate union which begat a vile son. But the evil queen, mother of the monster (for, you see, this was before he became king), had designs on her own son’s future and saw to it that the mystery wife was poisoned and the queen’s son publicly married (in a loveless arrangement). With the tempestuous new wife, the monster fathered his second son, a righteous boy, who was traded for the rival king’s offspring. But Kalibak’s gargantuan conceit and cosmic hatred for Orion are his Achilles Heel, but as we will learn, the Terror of Apokolips’s rage will transcend death itself. And we can feel the end is coming fast, in the form of an armor-clad specter on skis! Lightray beats Orion to the punch and, yelling “Orion has borne the burden of battle too long! Hail, Kalibak! Hail, king of tormentors!” he attacks the giant troll-like warrior, the “veteran of a thousand battles,” who gives the young new god a terrific pounding. But this time Orion’s half-brother is engorged with vastly increased powers, able now to emit “white-hot blast[s] of crackling energy” from his hands and strong enough to tear an entire apartment building onto Orion the Fierce. 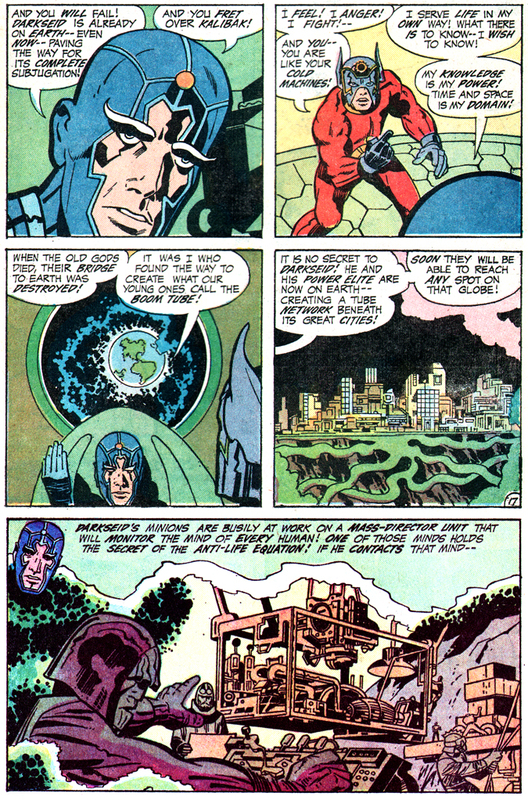 But Darkseid receives evidence that the fight is rigged, that Desaad has strengthened Kalibak as much as tenfold! Fearing his long-ago abandoned son may be dying at Kalibak’s hand, Darkseid disintegrates the sadist with the dreaded Omega Beams, the Total Wipeout, and the added power of Kalibak vanishes. 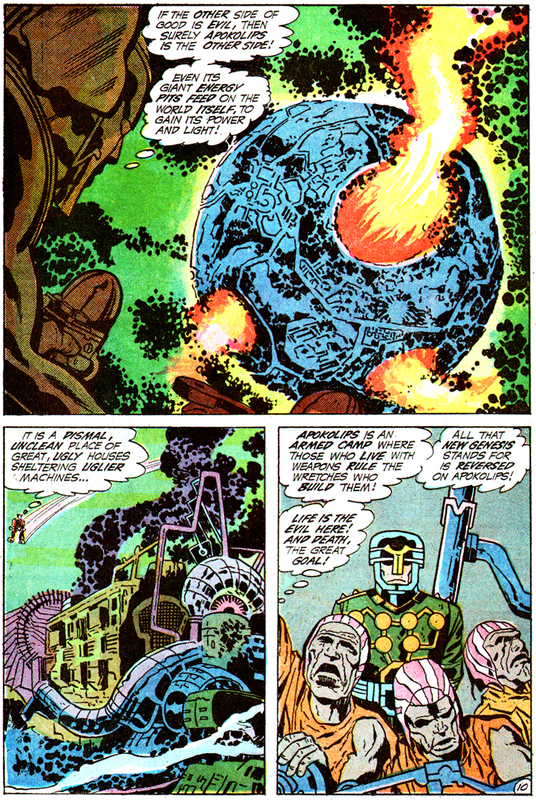 Posted 1 December 2010 in Apokolips, Day Entries, The New Gods #1, Weapons & Devices. We realize why the Master of the Holocaust needs to keep pressure on his own subjects, through fear, intimidation and apparently this machine — revolt might happened when the Lowlies miss their morning “brain-drain” breakfast! But why set one up on our world? And what is this so-called Anti-Life Equation anyway? Posted 29 November 2010 in Apokolips, Day Entries, Supporting Characters, The New Gods #1, Villains. 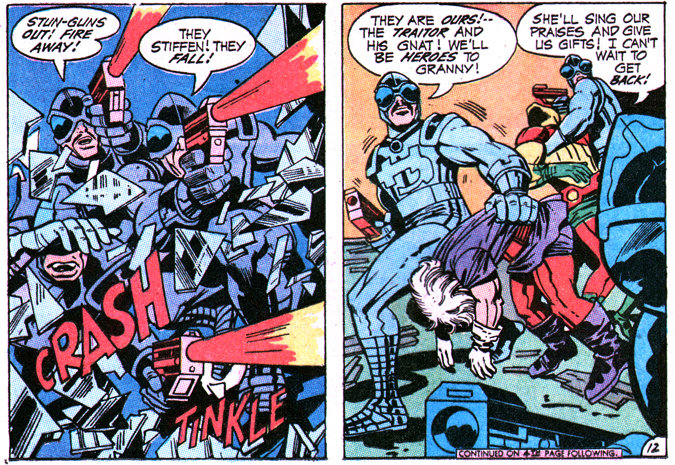 Gravi-Guards: Possibly the subterranean contingent of Darkseid’s shock troops are some of the earliest Earth invaders. These magenta-colored, oversize creatures are endowed with the power to “transmit gravity waves from heavy mass galaxies,” and are able to apply crushing weight to even the mighty Superman. 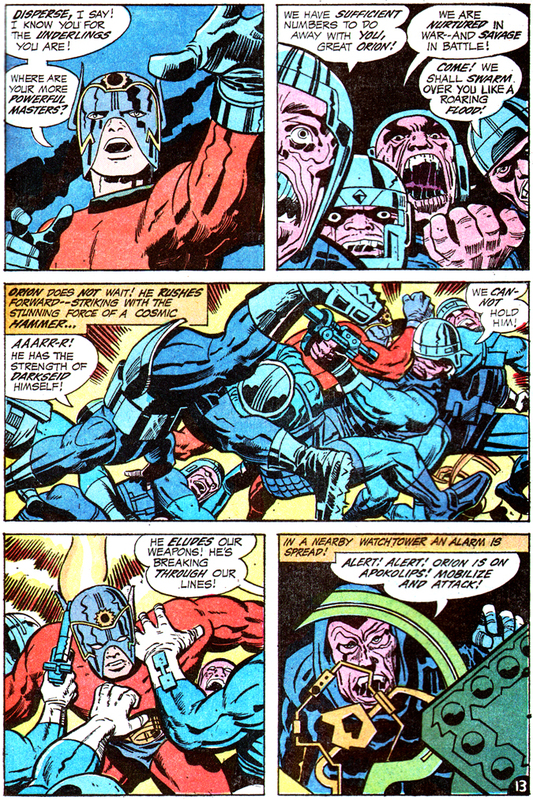 Darkseid’s personal guards are audacious enough to abuse even the Tiger-Force’s elites, as a couple manhandle and berate Mantis. 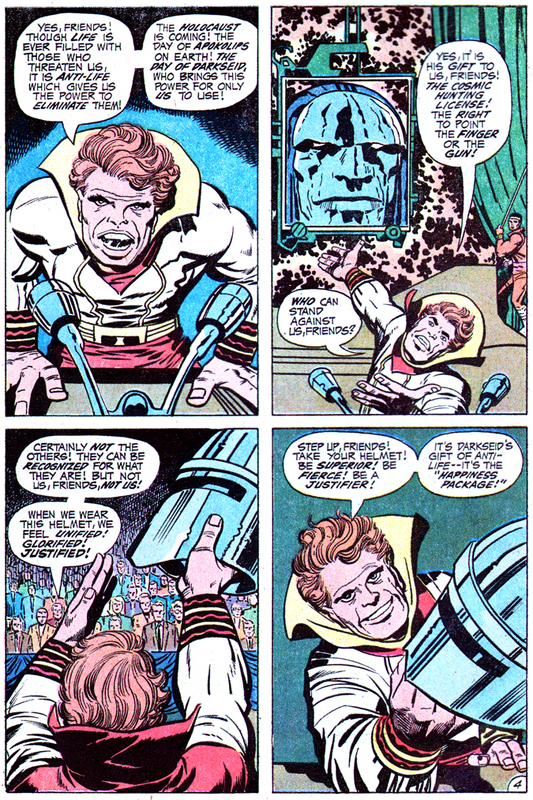 Glorious Godfrey’s Justifiers: While certainly a good number of the zealots are earth-born, others seem to be Apokolips natives, as one exclaims, “Anti-Life works! 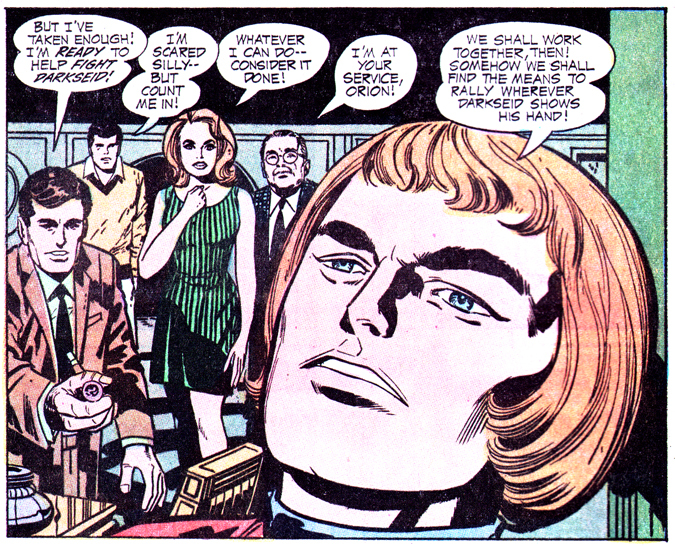 We’re justified in ridding the city of this human trash!” Godfrey’s immediate lieutenants look like Madison Avenue types, well-coiffed and one bespectacled; whether they are of Darkseid’s world is debatable. 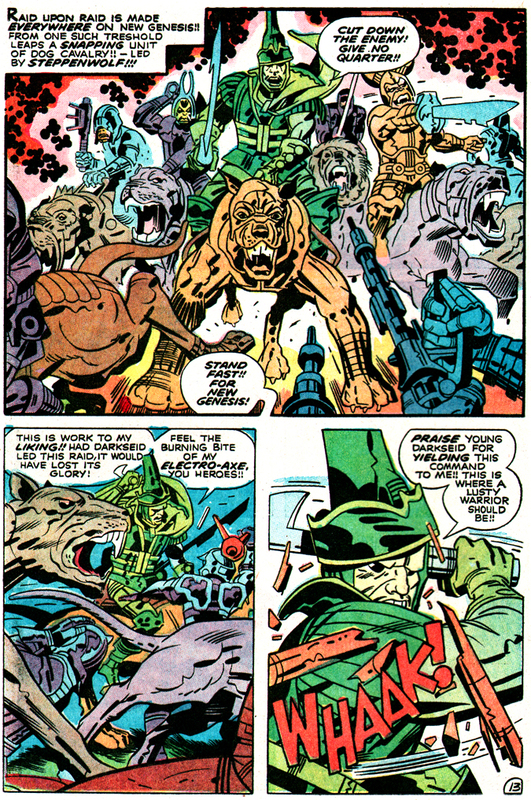 Back to the Apokoliptian hordes, Steppenwolf’s Demon Raiders appear in the hunting party sequence where Izaya’s wife is murdered (and likely a designation that becomes become Darkseid’s Raiders later in the saga). Certainly, the Para-Demons, both present and pre-Great Clash, qualify for minion status but are unique enough, methinks, along with the Dog Calvary [coming tomorrow! ], to warrant their own entry. Back on Apokolips, one of Granny’s military escorts is abused into submission by Big Barda upon her return to the barracks of the Female Fury Battalion. Virman Vundabar’s troops appear similar in appearance to Goodness’s crew and might be from the same company/division. In their Earthly encounter with Barda bathing in a stream, we even catch a glimpse of a couple of fancily-clad superior officers, who order her to be shocked by an Energy Disperser. Vundabar’s subordinate Klepp gives us another look at an upper-level officer of Apokolips. The Harrassers of Night-Time are “brutal, relentless, and efficient” in beating obedience into the young and fearful new recruits to Granny’s Happiness Home. We learn that Hoogin, the presiding Harrasser, had been demoted when Scott Free first escaped Apokolips. Though it’s definitely fear that keeps the subordinates of Apokolips in line, it is worth noting that in a “Young Scott Free” sequence we see the cadets dining mess and ascertain the food they eat, their “Energy Blocks,” are “saturated with ‘Brain Drain‘ chemical,” as phantom Metron informs the future Mister Miracle. Posted 28 November 2010 in Apokolips, Day Entries, Supporting Characters, The New Gods #1, Villains. There seem to be a few different varieties of the airborne sentinels, some with four-fingered hands, some five-fingers; others with three toes, a type with four digits on their feet. All are appropriately demonic in appearance, though certains ones decidedly better looking than their brethren. We can see they are relatively humanoid, but are they human? We’re not privvy to their origins but their services will no longer be needed by the time of The Hunger Dogs, being replaced with high-tech planetary shielding, as Lightray will learn. Armed with mechanized clubs, the para-demons boast, “Batter poles up!! Pick your man — and fly in swinging!! Go, demons! !” But, though “the sky is filled with darting, savage forms,” the future Mister Miracle eludes punishment and, in “a primitive first attempt at the ‘escape art,’ strikes out a raging, murderous sentry. 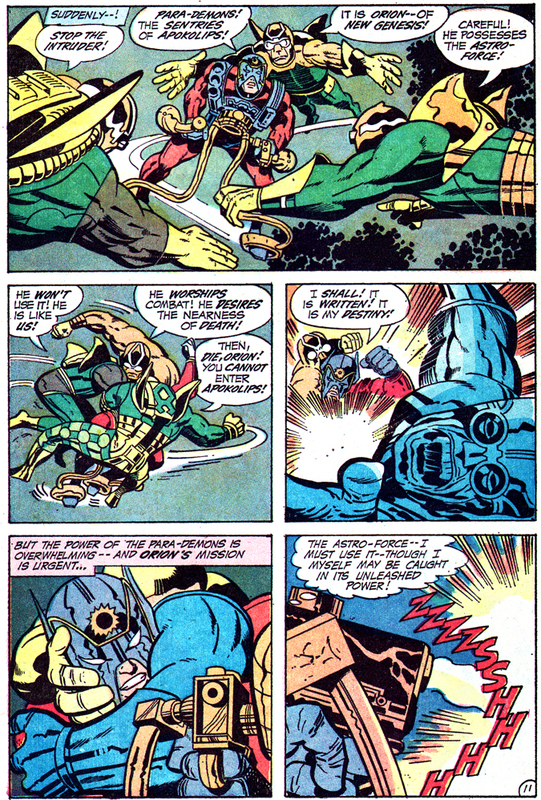 Para-demons are used in one of Darkseid’s innumerable attempts to kill Himon, as Mister Miracle’s mentor is “dropped by para-demons from the sky.” Needless to add, that and other attempts are unsuccessful… for a time. The hellish creatures seem not to possess wings in a traditional sense, but small, wing-like protrusions from their backs (possibly containing some anti-gravitational element?). Though they valiantly try, para-demons are unsuccessful in stopping Scott Free from breaking the pact by escaping to New Genesis.